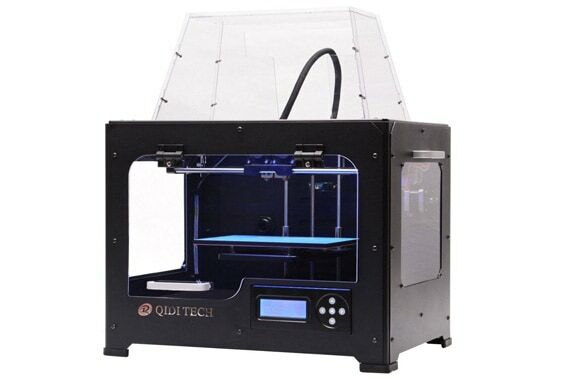 QIDI Tech 1 3D Printer Review 2019 - Why This 3D Printer ROCKS! Today, we delve into the inner workings of the understated QIDI Tech 1. Is it another low-quality bust or do we finally have here an affordable printer worthy of our time and attention? All will be revealed below. Right off the bat, the QIDI Tech 1 stands out for a design that is tastefully stylish. Putting aside the, at times, overly ambitious, Apple-mimicking approach of competitors, QIDI has opted for a look that is functional, clean, and well thought out. It’s a good looking machine, but without frivolities or unnecessary design flourishes. The construction is anchored by a black-painted full steel frame held down by its total weight of 55.1 lbs. The black color scheme is contoured by sky blue trim on the side-paneling for an understated professional aesthetic. The quality of the hardware is noticeable, and it’s clear QIDI haven’t cut corners and have sourced all parts from quality manufacturers. The print chamber is fully enclosed with acrylic paneling on the sides, as well as a sizeable removable plastic top cover, all held in place by magnetic contact points. The hinged acrylic front panel opens upwards to allow access to the build plate and does an excellent job of staying upright. Although non-heated, the chamber ensures uniformly distributed heat free of environmental inconsistencies like drafts and the natural shift in ambient temperature. 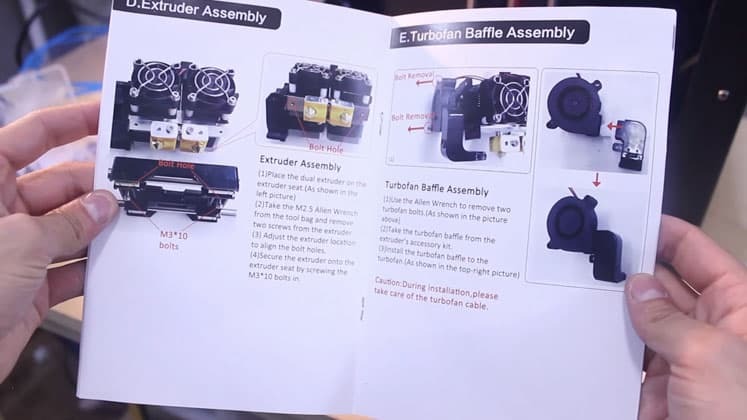 The printer also comes with a set of sturdy metal handles for easy transportation that won a boatload of points in our book given this feature is nowhere to be seen on the majority of printers. For increased stability, the four corners are bolstered by gripping rubber feet. The heated plate is made of high-quality CNC-machined aviation grade aluminum for added stability and smooth movement, reaching temperatures of 110 degrees centigrade. Gone are any issues with acrylic or ceramic plates warping under the strain of high temperatures plaguing previous versions of the model. The QIDI Tech 1 has a classic Cartesian configuration and uses Fused Filament Fabrication extrusion technology. Stepper motors swivel the X, Y, and X axes along vertical and horizontal metal rods using linear motion bearings. 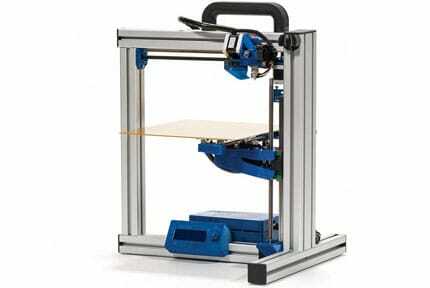 The build area totals a reasonable 230mm x 150mm x 150mm, more than enough for most home print projects. A CNC-machined high precision aluminum dual extruder setup with a Bowden feeder system manages the actual filament dispensing side of things. The nozzle diameter is a pretty run of the mill 0.4 mm that can handle layer resolutions from 100 to 300 microns, depending on print speed. The print heads max out at around 250 centigrade managed by a set of turbofans. 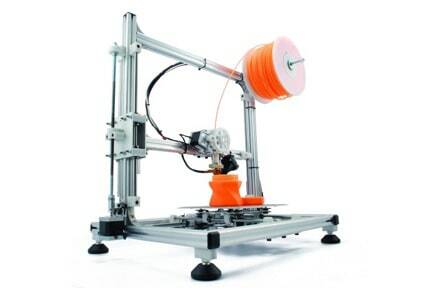 The Tech 1 can print in ABS, PLA, PVA, and HIPS using open source 1.75 mm diameter filament. QIDI offers an array of colors including orange, silver, red, yellow, black, green, gold, gray, blue, purple, white, and so on in 1kg spools, but filament from a third-party distributor works equally well. In another improvement to the previous iteration of the Tech 1, QIDI now ships the model with a new industrial-grade closed-source board designed to reduce signal interference and circuitry static. The printer is controlled via a fitted LCD screen with a set of five control buttons. The display is functional but adequate for launching prints, bed leveling, and choosing the right filament type for a project. Connectivity is assured through an SD card interface in addition to USB linked up to a computer. 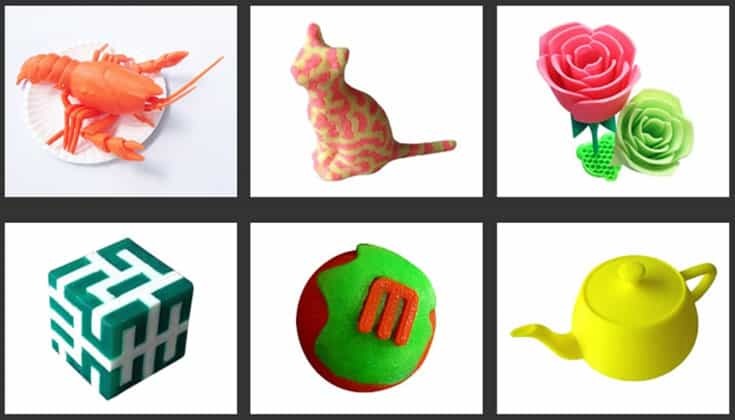 QIDI provides its own proprietary slicing software unsurprisingly called QIDI Print, but the printer itself is compatible with other slicing applications like Ultimaker’s Cura that use the .gcode format. QIDI is Windows and Mac compatible. The QIDI Tech 1 arrived well packaged suitably laden in double boxing, styrofoam trays, cable ties, and plastic sheets for the various bits that ship with the printer. The long journey from China unquestionably put the printer through its paces, but overall the foresight taken by QIDI to protect the printer was excellent. The package includes the QIDI Tech 1, a quick start guide, a bed for PLA printing, a leveling paper, official documentation, user manual, one spool of ABS, one spool of PLA, spool holders, a roll of blue painter’s tape, a power supply, a scraper, filament tubes, tools, cables, 4GB SD card, acrylic covers, handles, parts box (including fuses), USB cable, USB SD adapter, and glue. QIDI has indeed covered every angle when it comes to accessories throwing in a few extras for good measure. In terms of assembly, the Tech 1 is by most definitions pre-assembled but does require a bit more installation time than other models that fall into this category. The first step is removing all the protective styrofoam inside the printer, clipping the ties holding the Z-axis from moving around during transit, and removing the top cover from inside the chamber. Next, we had to install the extruders, a process that turned out to be simpler than expected and only involved sitting the extruder in its bracket then tightening a set of bolts, fitting the cables, and tubing. Moving forward, we secured the baffle to the fans, which once again was easy enough. The spool holders are installed to the back of the printer by twisting them into the sockets. 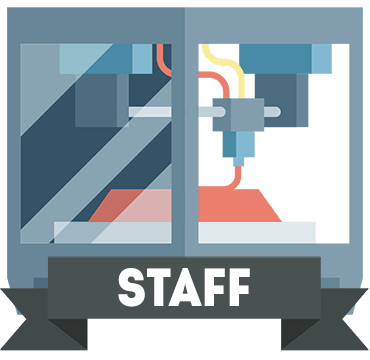 Their position is a smart design choice as they don’t take up any vertical space and sit comfortably out of the way, yet in proximity to the extruder. We then secured the carry handles and attached the front door via a set of hinges. Although the instructions weren’t written in the best English, they were clear and concise with helpful color pictures. We had no problems following them. Once powered up, the Tech 1 walks the user through first time setup, including loading filament assisted by the display, which is as simple as feeding it into the tubing until the extruder gears get hold of it. Finally, we had to level the bed manually due to the lack of an auto-calibration feature. In most cases, this would be a big negative, but the process is incredibly straightforward. Tighten a set of four bolt knobs using the leveling paper provided. For a printer priced around the $600 to $700 mark, the QIDI Tech 1 blew us away with the quality of the prints it produced. Surfaces are smooth, details rich and apparent, and we didn’t encounter any botched print jobs over a week of use even when using different filament colors through both extruders. Like any entry-level printers, a few imperfections crept up here and there, but nothing that acetone and a bit of post-print editing couldn’t fix. We did find that the build plate shifted ever so slightly after a few prints and as such had to calibrate it occasionally. As advised by the instruction manual, we found that PLA prints worked best when the covers were removed. Overall, our experience with the printing process was a genuine joy, and the Tech 1 churned out print after print without any severe problems. Although the six-month warranty provided by QIDI is on the low side with no scope for buying an extended warranty, the customer service is top tier with an experienced and knowledgeable 24 hours customer support team available through Skype, phone, or email. For added peace of mind, the Tech 1 is CE, FCC, and RoHS-certified. QIDI are quick to provide support in case of issues and ship out replacement parts incredibly rapidly giving step by step instructions to replace any hardware components. Delivery times can vary based on stock levels and the recipient’s location, but overall we received ours within a week of ordering. We have heard stories of Tech 1 being damaged in transit due to the long journey from China, but in every case, QIDI has done its utmost to remedy the situation and provide guided repairs without any hassle. 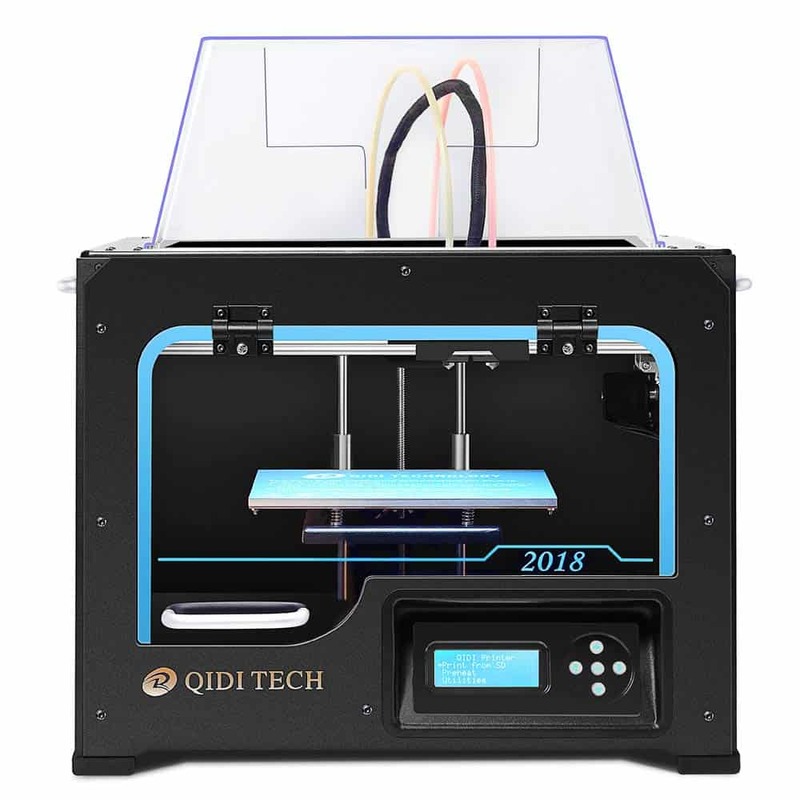 Unlike many 3D printer manufacturers who offer newly branded replacement models instead of perfecting existing models, QIDI systematically works on improving the QIDI Tech 1 and periodically release an updated version, and has been doing this since the printer first launched back in 2012. The price never fluctuates, and QIDI keeps making the printer better. The most recent iteration came to light in 2017 and is miles away from the wooden frame, absent LCD screen and top cover of the original. By adopting this continuous upgrade approach, there’s a sense that QIDI believes in their product and are eager to enhance it based on user feedback. For a field riddled with opportunist companies eager to get their hands on a slice of the 3D printing pie to the detriment of product quality, it’s comforting to know QIDI values providing builders with the best possible 3D printer they can manufacture. Unfortunately, we often associate manufactured goods made in China with a complete absence of customer service, but QIDI completely buckles the trend and provides support all companies should strive to provide. We see the QIDI Tech 1 3D printer as an ideal starting point for a budding maker and even a veteran who wants a reliable all-around workhorse. The sheer versatility and robustness of the build cater for all manner of projects. You’d be hard pressed to find such a systematically reliable printer within the same price range. The assembly is a little more involved than other pre-assembled alternatives, but nothing insurmountable. The only real minus is the position of the SD card slot, which is actually inside the chamber rather than outside. These remain minor issues rather than balance swinging negatives. The QIDI Tech 1 is hands down the best sub $700 3D printer on the market. 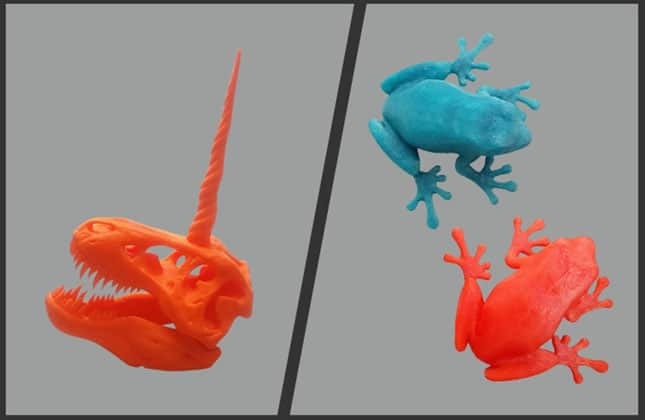 The quality of the craftsmanship, the intelligent design, and an overall versatility bolstered by the dual extruder setup make for a printing configuration that is at odds with the price.